Want to read a awesome Star Wars Comic? Read the Lando mini-series! One of the things that Marvel Comics has decided to do with one of their comic lines is to have a series that focuses on different characters. Lando was the 2nd in the line (the first was Princess Leia). 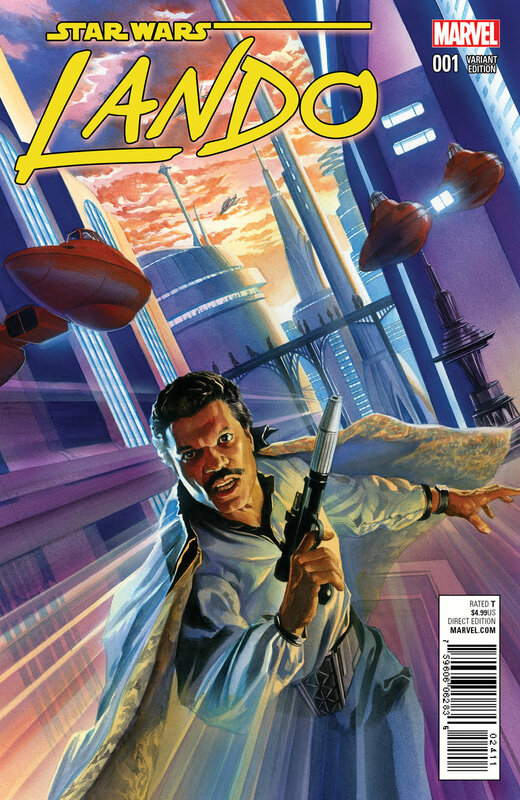 In the 5 issue Lando series, Lando, along with his sidekick Lobot are hard on their luck and discover that there is a potential big score for the taking. The “big score” just happens to be stealing a very unique space ship. Before Lando and his crew realize it, they are in a heap of trouble and there doesn’t seem to be a way out. Lando and Lobot. Their relationship is the heart of the story and it is one of the best relationships I have seen on the pages of the comic so far. It is genuine, has a depth to it, and is in many ways compelling. Lobot’s motivations within the story add such a weight to the life of Lando that you can not help but watch The Empire Strikes Back a bit differently. And that is a good thing. The tone. The tone is dark and at times creepy. The art of Alex Maleev helps a great deal with this. His thick lines in the close ups on characters faces gives each panel a dreamlike and creepy vibe to the story. I love that aspect of the comic. The twists and turns. There are several plot twists in the story that are not only surprising, but they delight you as you watch the characters try to deal with and figure out the situations they find themselves in. All of the above results in a blend between a heist and horror story, with a tale about friendship at its heart. Not much. Seriously, I love this comic. There have been some gripes about “the twins,” two catlike creatures on Lando’s team, that some readers found to be silly. I did not see that. In fact, as the story progresses, these two relatively silent characters added to the creepy tone that the story is trying to convey. Another issue could be found in that the writers don’t explain all the details about the items that Lando and his crew find on the ship. But again I would contend that it adds to the story and the mysterious tone that exists within it. Overall… well you guessed it, I LOVED this comic. Charles Soule, the writer, has crafted a wonderful story that actually adds a depth and dimension to what takes place on Cloud City in The Empire Strikes Back. It is an exciting, creepy, and emotional story that ends on a very surprising and heartfelt note. The trade paperback releases on January 19th.